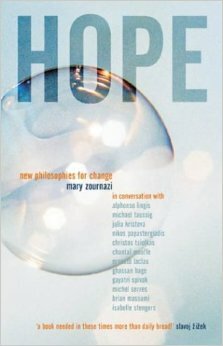 For the third edition of BOOK CLUB we will review Mary Zournazi’s Hope: New Philosophies for Change. Starting next week, a new post will be published every two weeks focused on each section of the book. For each section, Temporary contributors will initiate a discussion through the comments in the post and anyone may continue the discussion by contributing their own comments and observations on the text. Hope: New Philosophies for Change may be purchased as a hard copy or is available as a .pdf download courtesy of University of Wollongong’s digital archive. Excerpt from Prologue: This is a book about hope. To me, ‘hope’ is about a certain generosity and gratefulness that we all need in life. If life is a series of encounters and chance meetings, events and social relations, then hope lies across all of these. It is a basic human condition that involves belief and trust in the world. It is the stuff of our dreams and desires, our ideas of freedom and justice and how we might conceive life. In this book, hope is also about a spirit of dialogue, where generosity and laughter break open a space to keep spontaneity and freedom alive – the joyful engagements possible with others. For in any conversation – individual or political, written, spoken or read – there needs to be the ability to hear, listen and give. If we shut down a discussion through resentment, fear or unwillingness – through adversity or polarised individual or political positions – generosity ceases, and the openness of real discussion and debate is diminished. When a dialogue is not permitted there can be no space for exchange – words and ideas become self-enclosed and the exchange becomes a kind of monologue, a type of depression and narcissism where territories are defended and the stakes raised are already known. Reflections, conversations and dialogues build new social and individual imaginaries – visions of the world that create possibilities for change. They lift us out of despair and let us take new risks in our encounters with each other. What I pose here is the ethical and political responsibility we can share in writing and thinking about hope. This is about collaboration – in writing, in thinking, in politics – how working ideas together, across different styles and traditions, can let new ideas, views and expressions emerge. This involves a sense of trust and a ‘faith without certitudes’ about where hope may lie in thinking about the future. In secular times, when hope has moved out of the religious sphere, the turn towards the future may be found in struggles for individual justice, and in political activity across the globe. Alter-Circuit: Shiyuan Liu, My Paper Knife at Et al.